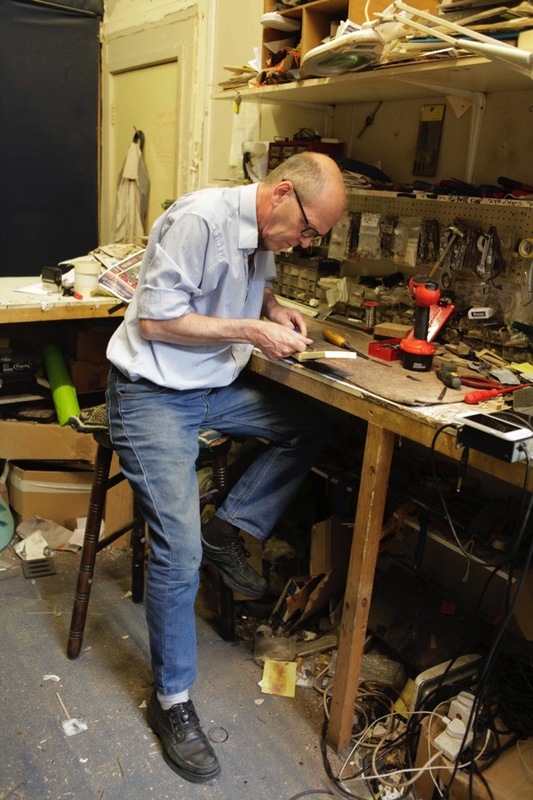 When the late and greatly-missed photographer Colin O’Brien & I visited Denmark St last summer, Colin took these portraits of guitar maker & repairer, Tim Marten – so recently I went back to interview Tim and today I publish his story accompanied by Colin’s pictures. 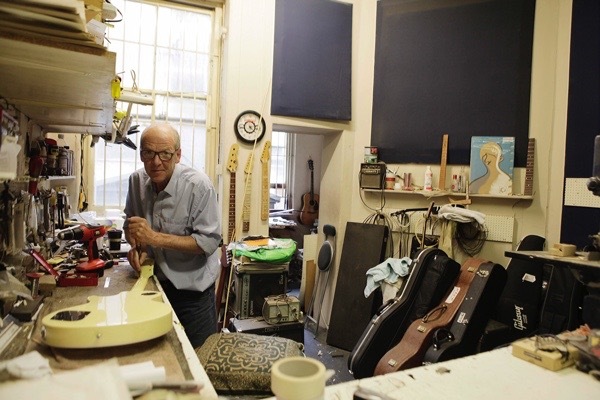 Guitars have been manufactured in Denmark St since the days of Queen Anne but now – thanks to the redevelopment of the neighbourhood - Tim Marten is one of the very last to make and repair instruments in this corner of Soho. I visited Tim in the tiny panelled workshop in the beautiful sixteen-nineties house where he pursues his trade, pending three months’ notice to quit at any time. “When I was a teenager I wanted to learn to play guitar, and I couldn’t afford to buy one and I was reasonably good at woodwork, so I made one. It was horrible! As soon as I’d finished it, I began to understand where I’d gone wrong, so I embarked on my second one and I cured some of the mistakes I’d made the first time round. After about eighteen months – maybe longer – with the help of various other people, I’d finished my third, curing the mistakes I’d made the second time round. I refined it down and down, until I had a guitar I could actually go out and play. It held its own against factory-made bought guitars. That was quite a reasonable instrument, and I went from there! I came from an engineering background. My father and my uncle were both very good engineers and I used to build Airfix kits and fly model aeroplanes. I was always interested in mechanics and quite good at understanding how things worked. I was one of those small boys whose immediate reaction after Christmas lunch was to start taking their toys apart to see how they worked. I spent my late teens and early twenties playing in bands round London and Bristol and, if anyone had problems, I’d fix their guitars. It just escalated from there. 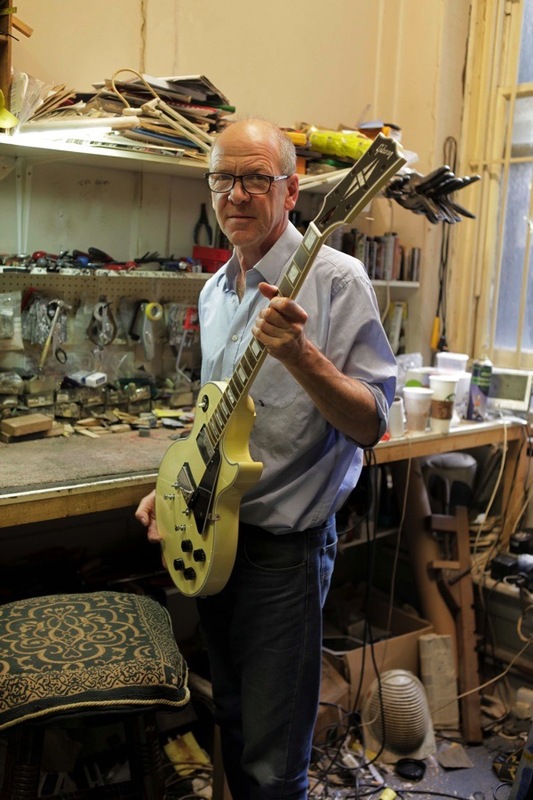 I was fortunate to meet someone who worked behind the counter at Andy’s Guitar Workshop in Denmark St, just across the road from where I am now. 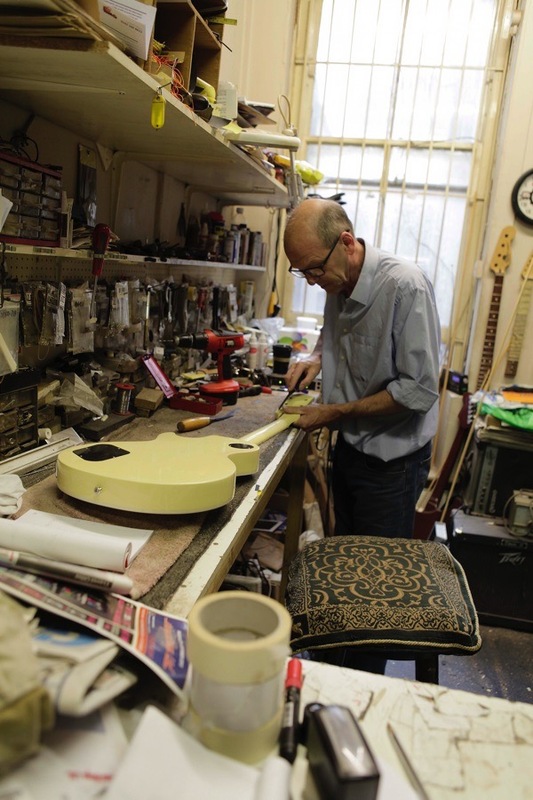 It was the first specific guitar repair workshop in Central London. That was in 1979. It was run by Andy Preston but it was called ‘Andy’s‘ because that was the name of the Greek greengrocers on the ground floor and we were in the basement. There were quite a few music shops in the street but Andy’s had flats above and a greengrocer at street level. Our customers had to go round the back and down the stairs to our workshop below. I was twenty-two and I had some ideas I was working on for designs for guitars, and my friend who was the counter hand said, ‘Why don’t you come down and speak to the guys I work with?’ So I did and we had a long chat, and I was offered my first job and I’ve been doing it ever since. Then I joined Led Zeppelin as a guitar technician and went off touring for ten years. I worked for various other bands and had a shop of my own up in Church Lane, Hornsey, just underneath The Kinks‘ studio. So I got to know Ray Davies and did a lot of touring with The Kinks. I played guitar professionally and found I earned more money gigging three nights a week than I did mending guitars in my little workshop, so it became a necessity to go out each Thursday, Friday and Saturday and play. Back in those days, it was quite a lucrative thing to do. Things went spectacularly wrong in 2000, and I lost the shop and my business. But within a couple of days of realising that was going to happen and wondering what on earth I was going to do with myself, Andy Preston rang up from his hugely-expanded guitar shop which had become internationally known and taken over the whole building. He asked me to come back and run his repair department because they needed somebody with experience. So the door opened and I walked into it. I stayed there until Andy went bust and sold his shop onto Rick Harrison, when I started working independently and I’ve been independent ever since. I’ve had my workshop in this room for about six years, before that it was Central Sound recording studios. I have no proof but I have been told that David Gray recorded Babylon in this very room. The building has listed status and is as it was constructed after the Great Fire of London, one of four remaining buildings in Denmark St from that time. This was originally intended as housing and it is slated to be returned to housing. I am going to be booted out and this is going to be turned into luxury flats. I am on two months’ notice, so that could happen as soon as six months from now. I don’t think the ethos of Denmark St has changed very much at all since I first came here in 1979. Up until four or five years ago, when Cliff Cooper sold out the leases to the current owners who are property developers, there was very little change in the street apart from the signs above the shops as businesses came and went. Denmark St has always been a bit of a shabby sideshow in very nice way. From the fifties, it was always the centre for music, when the music publishers started moving in and then the recording studios followed. There were three recording studios here in the sixties. From the eighties, shops came and went but they were always music shops, and the place was in need of a lick of paint. It has always been like that and, to a certain extent, that is its charm. Now restaurants are moving in, the developers are taking over and we are being moved out. It’s coming to an end despite our loudest protests. We got hit very hard by the internet and it took the industry a while to adapt. I think that was one of the reasons Andy got into financial difficulties. For the repair side of the business, the internet helps no end. I get a lot of work from people who have bought guitars online. They come in the door, I take one look at it and say, ‘You just got this on ebay, didn’t you?’ and they ask, ‘Yes, how did you know?’ and I say, ‘Because if you’d played it before you bought it, you’ never have bought it!’ I tell them, ‘Yes I can fix it for you but it’s going to cost more money than if you had bought it properly from a shop in the first place.’ So I view the internet as a mixed blessing, although I do make a lot of money out of people who buy stuff and find that it is not as described. I end up sorting it out. Like any job, it can become repetitive. There are certain repairs you do in your sleep. That’s what I call the bread-and-butter work. It’s well paid, so – if I spend three days a week doing that – I know that I’ve made enough to sit down and do something a bit more creative. In this industry, it’s a great way to spend a day but it’s a lousy way to make a living. 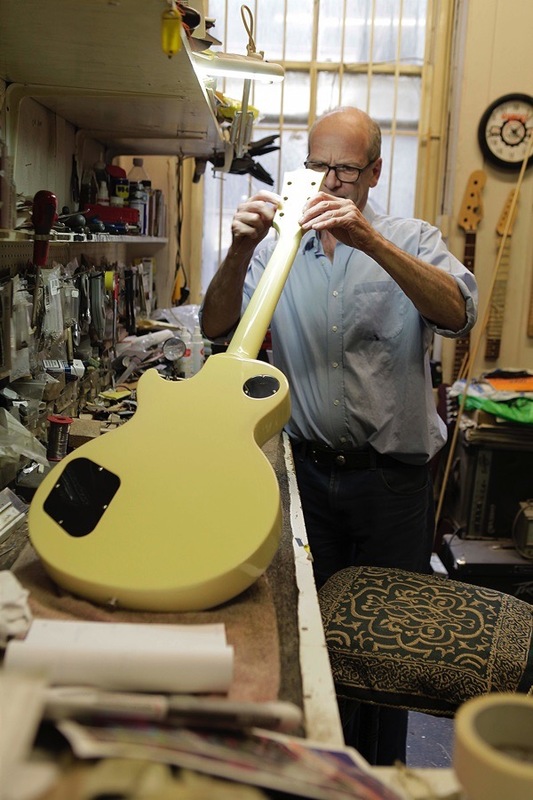 Especially making guitars, because it is so time-consuming and you can’t compete with the guys who have got all the machinery and industrial spraying facilities. The quality of the stuff coming out of the far east now is so good that you have to be able to charge a disproportionate amount of money for a guitar because it is handmade. Or you do bespoke work, I enjoy making things that you couldn’t buy in a shop. If you look around my workshop, you will see that I am surrounded by projects that I have got halfway through but never got around to finishing. It’s what I do in the quiet periods, but I’ve acquired a reputation for being good at repairs and it’s getting to the point where I have more work than I can do. If you look around, there’s thirty guitars here waiting to be repaired. They are numbered up to fifty-seven and I am working on number twenty-six at the moment. Some of them will take five minutes but others will take me three weeks to fix. I’ve always got three or four jobs on the go at once and, as you can see, there there are guitars lying around in various stages of repair. While I am waiting for glue or lacquer to dry, I will put it on one side and return to it tomorrow. Repairing instruments is a job where you don’t work on one at a time and finish it. Read and forwarded to many friends. Denmark St was wonderfully disappointing the the first time I went there – but then I realised what a brilliant treasure it was – starting with exciting parties on rooftops, to the squished and ‘intimate’ 12 bar club, to stinky basement bars. I’m not a musician but am friends of many and it felt like a proper place for music to be made. Hey ho. As a musician Denmark St and Charing Cross Road was the place to go for selling, buying, gossip, and finding out who’s playing with who. Unfortunately another example of a small area of London lost to Mammon, steel and glass development. I’m not so sentimental as to believe that cities shouldn’t develop. but the way Soho’s going it’s soon going to have about as much atmosphere as Knightsbridge. When one thinks of the artistic and cultural life that the district’s hosted (and no, I don’t mean Andrew Lloyd Bloody Webber) it would be a crime to let it die. 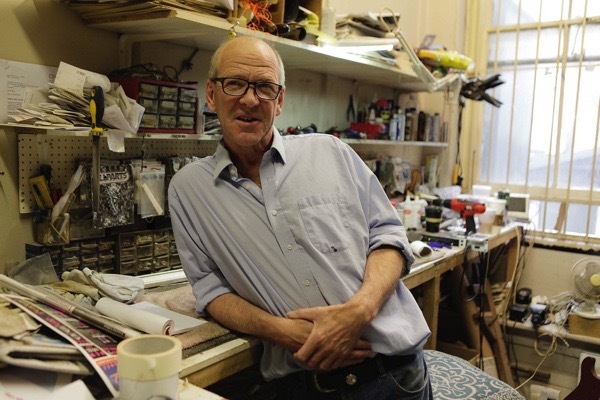 A fascinating insight into the life of the independent craftsmen who are the lifeblood of London. Tim, I hope you carry on, we can’t afford to loose people like you, there will be no one like us around anymore, I do hope you’re find someone that will let you use some spare room they don’t use around you’re area. I wish you well Tim, it don`t matter where you luthier, just keep doing what you do, hopefully nearby. I did buy, and part exchange over the years at andy`s, also attended the `Forge` blues jams, before it became the `12 bar`. Good luck Tim, I wish you well. A.J. Very sorry to hear this news Tim. Hope you can find a new base that will do you justice. The Streets of London have a very poignant history, as I know you know. Best wishes to you, your clients, friends and family. If I could help let me know. Tim Martin.